In San Francisco, a fickle, foodie city, the half life of restaurants is about the same as radioactive matter. Few survive long term. Of those who have accomplished longevity, our favorite is Acquerello, in business since 1989. Julie and I have been regulars there after I discovered it in an early Michael Bauer Top 100 list more than fifteen years ago. 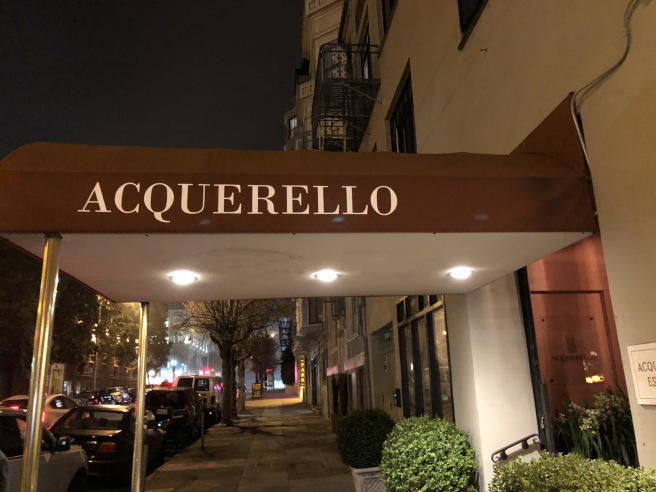 Since then Acquerello became the first San Francisco eatery to receive a Michelin star (2007) and later, elevated to a more exalted two-star status (2015). 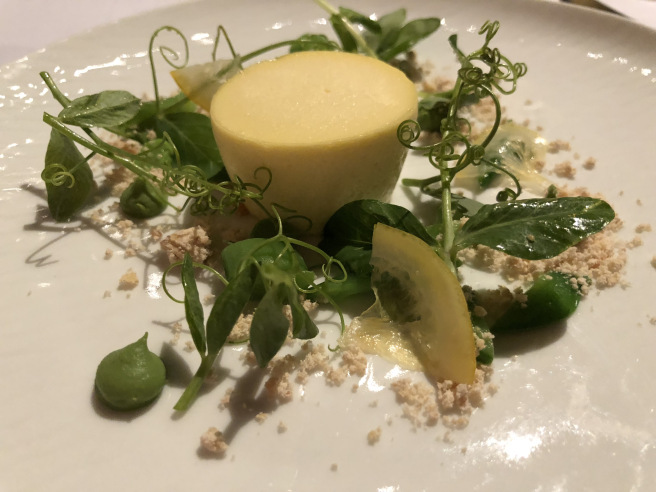 Michelin stars bestow not only prestige but attitude. Haughty chic and faddy arrogance are common. Acquerello manages to avoid these and maintains a warm mom & pop feel. 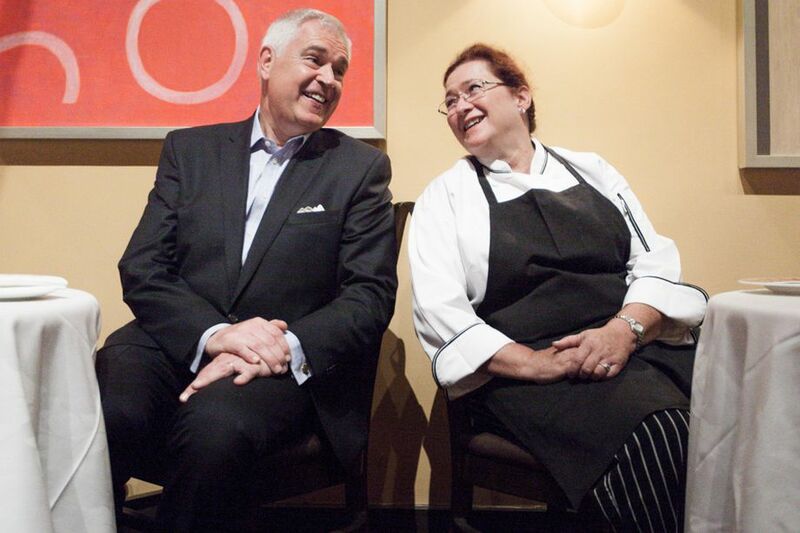 Credit goes to co-owners Giancarlo Paterlini and Suzette Gresham, Executive Chef. 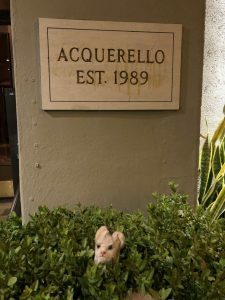 We visited Acquerello recently and discovered that it was still so. 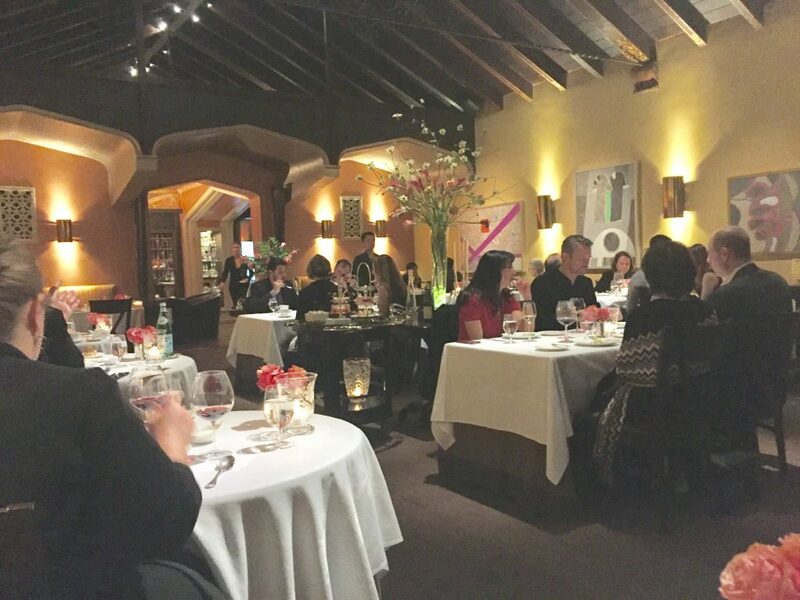 The restaurant’s chapel like dining room with its vaulted wood ceiling exudes somber elegance. 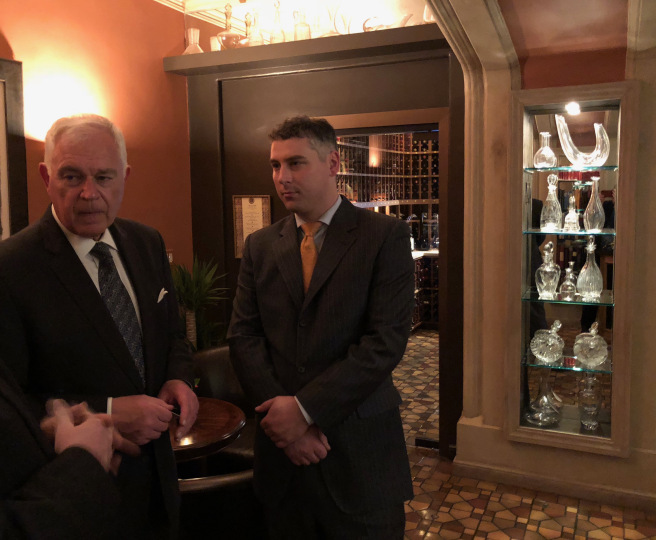 So does Paterlini, a prominent presence in the dining room, as he makes regular rounds through the tables and delicately pours wine from an array of signature decanters kept a center table. He has aged some, as has his restaurant, his hair white, his neck hunched, but he is as graceful as ever. Our waiter Franco Trudu had served us several times before. He recognized us immediately and greeted us with a warm welcome back. He too had aged some, his beard showing flecks of white, his heavy Italian accent nowadays softer. 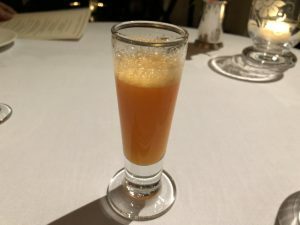 While we perused the menu we were served an aperitif of orange juice with vermouth. Soon afterwards two amuse bouches arrived. 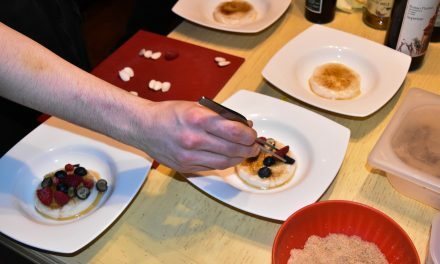 The amuse bouche, a tiny freebie, has become a signature statement from the chef at high end kitchens. Nowadays, many restaurants serve more than one, the bite size morsels packed with variety of exotic flavors. 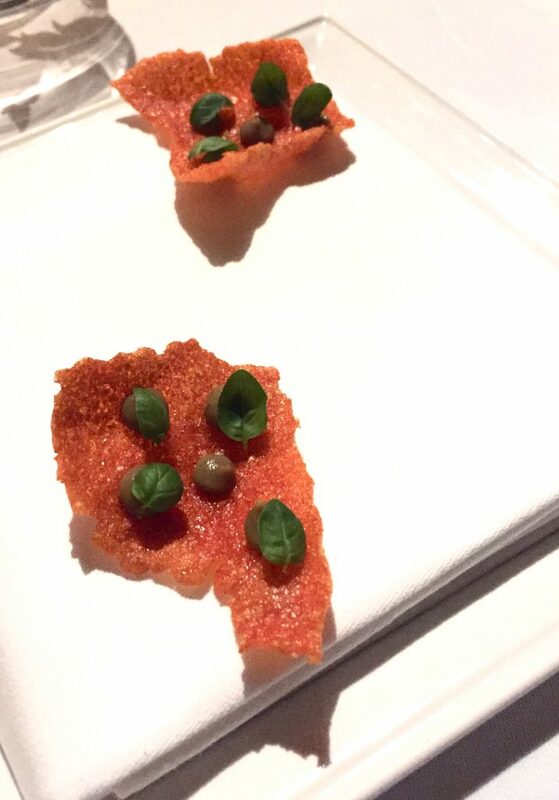 The first was a bell pepper chip with eggplant purée and basil. How they turned a pepper into a crunchy chip is beyond me. The presentation was a true work of art. So was the flavor it delivered. Next, panello with tomato paste atop. Soft and chewy, it had a nutty, chick-pea flavor, the tomato paste a subtle garnish. 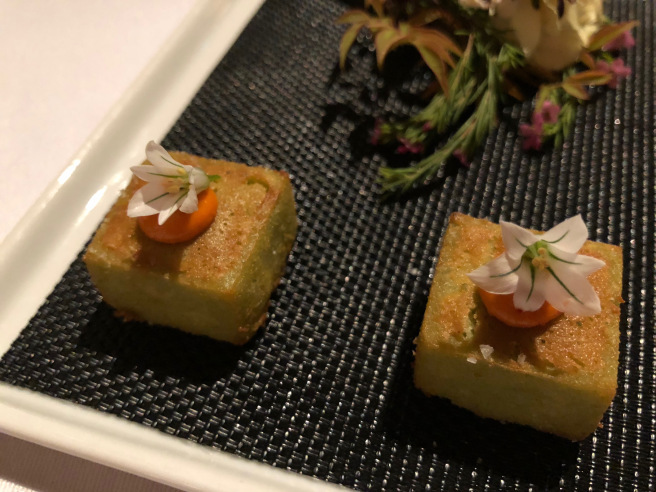 The menu offered three, four or five course prix fixe options for $105, 130 and 150 per person respectively, reasonable compared to other two-stars in San Francisco. 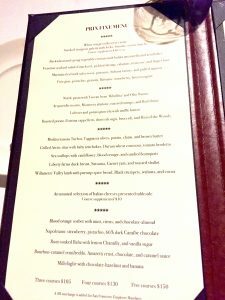 It also offered a huge Chef’s Tasting Menu that we declined. We settled on four courses. Navigating their 2000 bottle wine list, mostly Italian, I couldn’t decide between two whites, Verdicchio from Marche versus Friulano from Veneto. I asked for help. The sommelier was Gianpaolo Paternili, the owner’s son. He has been serving there since 2007. After hearing the style I sought, he confidently directed me toward a different bottle, a label I had never heard of. 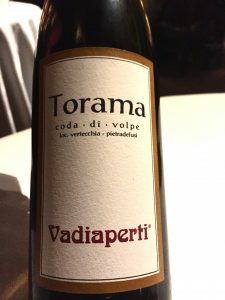 The 2015 Torama Vodiaperti from Campania was indeed it, dry, fruity and crisp. I was also pleased because unlike many of his brethren, Gianpaolo had not steer me to an upsell. The price was in the same range as the ones I had inquired about. 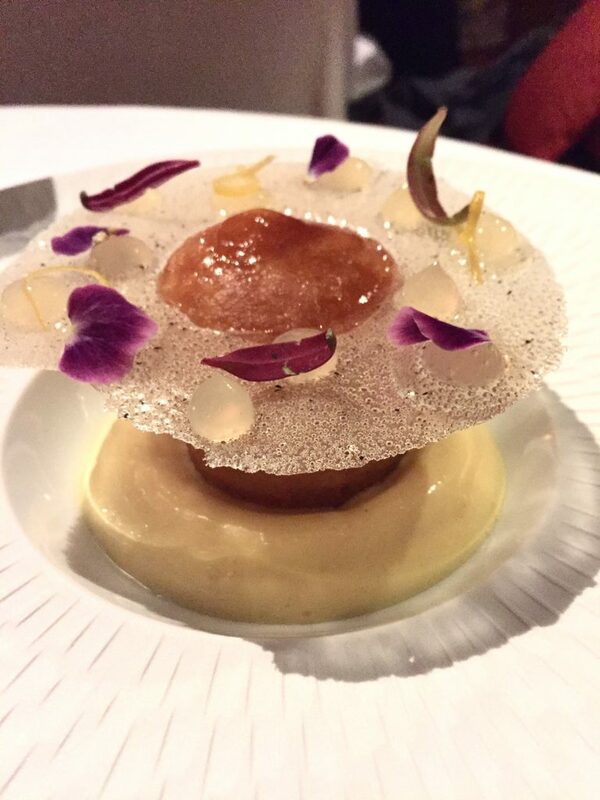 A third amuse bouche was now delivered, Acquerello’s signature dish: cheese budino. Budino is an Italian custard usually served as dessert. The cheesy appetizer version is unusual and delightfully unique. The first course followed. 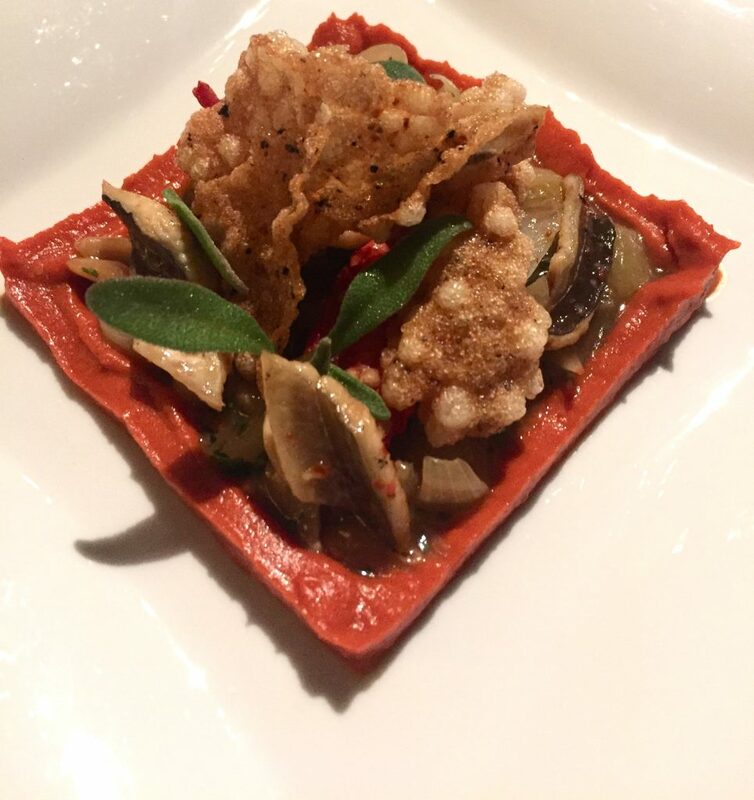 Mine was marinated eel atop a thick square of red pepper salsa, garnished with pine nuts, Sultana raisins and puffed tapioca. The tapioca had a potato chip-like crunch. 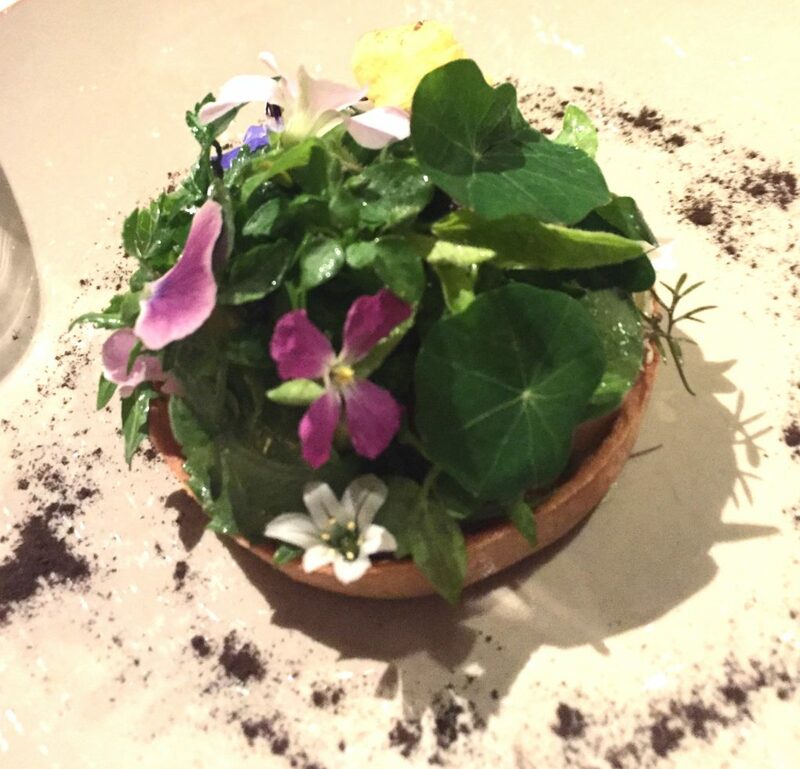 It was an exquisite presentation and the dish offered a variety of exotic flavors that somehow melded well. Julie got a Buckwheat and spring vegetable crostata with buffalo mozzarella and artichoke. The white wine was disappearing fast. 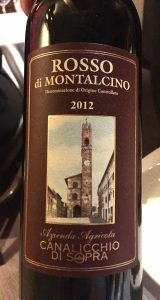 In preparation for Julie’s next course, cappelletti with short ribs and hen, I requested a Rosso di Montalcino. There were several choices. 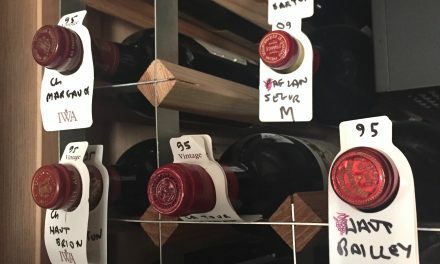 Gianpaolo recommended an older, more nuanced Rosso. 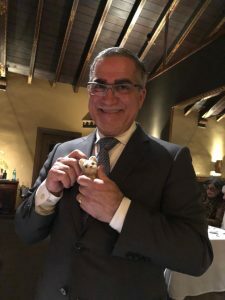 The 2012 Canallicchio di Sopra was well balanced, smooth, light in alcohol, and had a smoky profile reminiscent of Southern Rhone wines that I favor. It went well with Julie’s heavy pasta dish. 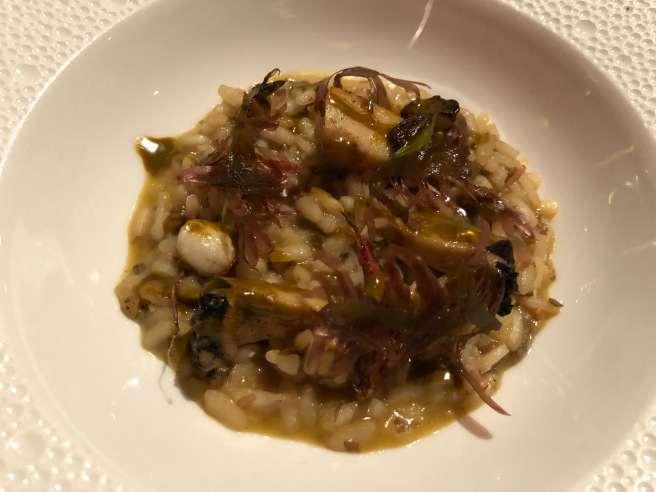 My choice was abalone risotto with turnips and Red Dulse. I had expected it to go with the white wine but the dish had a smoky flavor and it too was better with the Rosso. 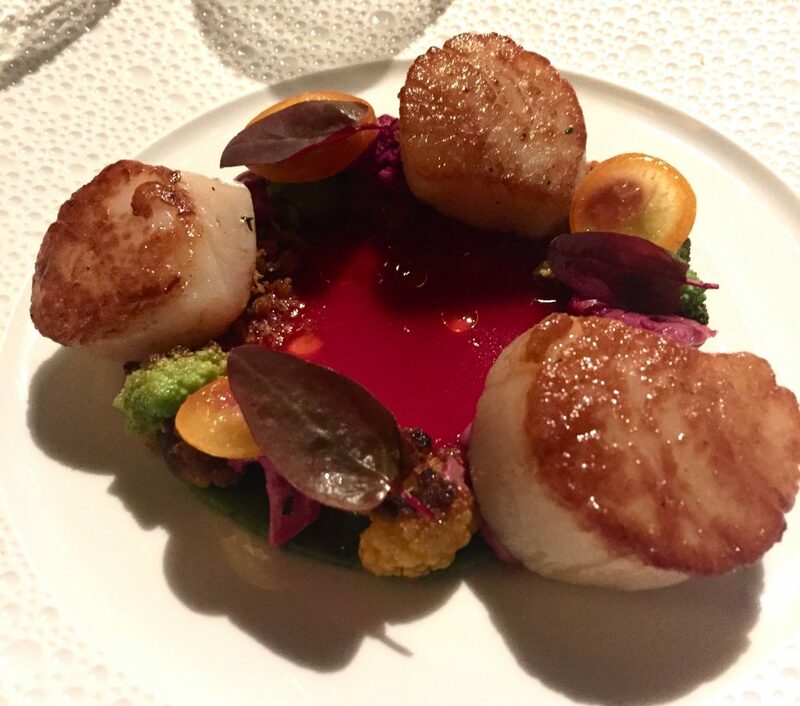 The main course was scallops that melted in your mouth, with cauliflower, blood orange and candied kumquats. The wines, white or red were equally at ease with the dish. 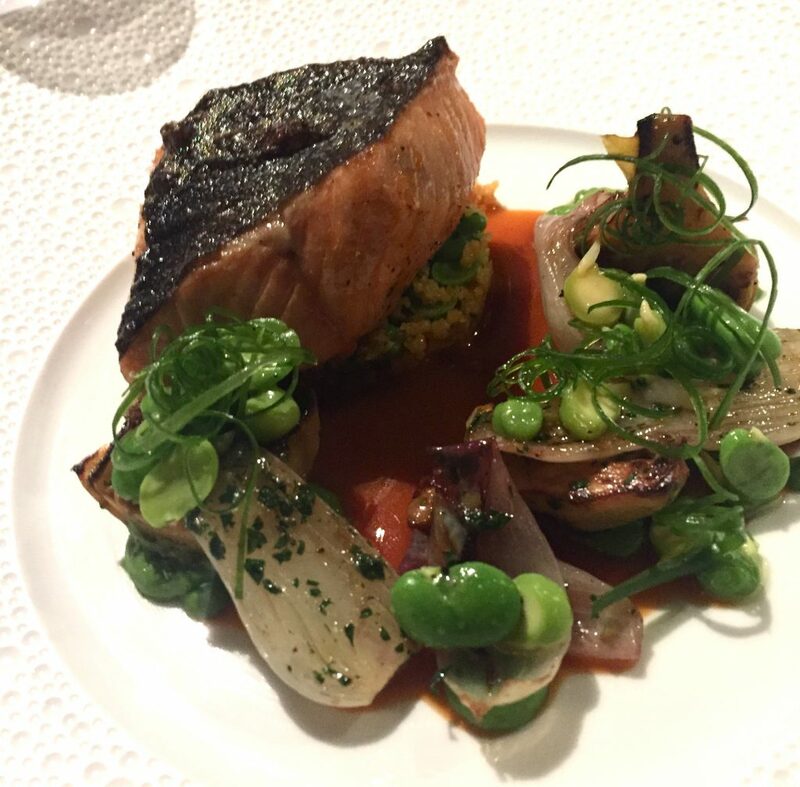 Julie remarked that her grilled Arctic char with baby artichokes, cous cous and brodetto was also very good. The fourth option was dessert versus cheese. I always go for the latter because I know full well that a petit-four cart will follow, filled with as many sweets as one can handle. 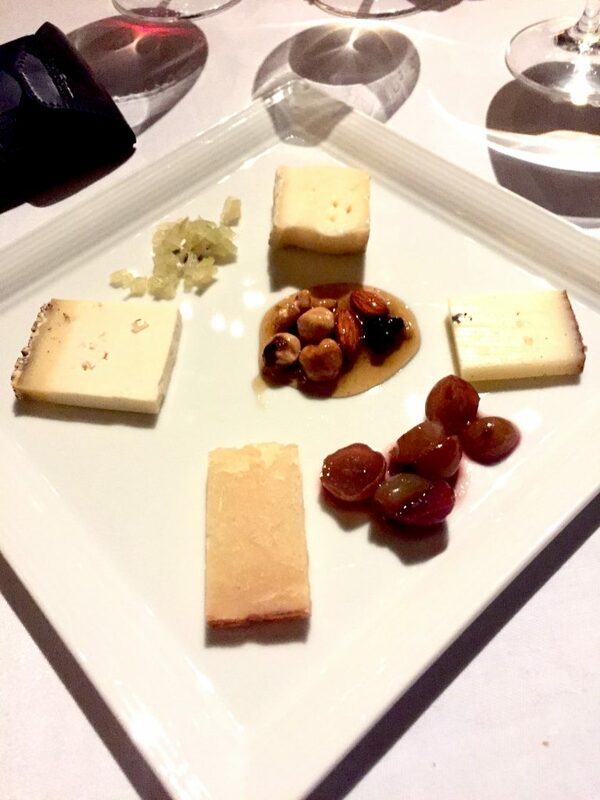 I selected soft goat and sheep cheeses with preserves, candied phenyl, and nuts, polishing off the remainder of the Rosso with it. Julie went for the dessert, a rich rum-soaked baba with lemon Chantilly and vanilla sugar. It was a classic baba-rum rendered modern with a surreal candy visor circling its top. 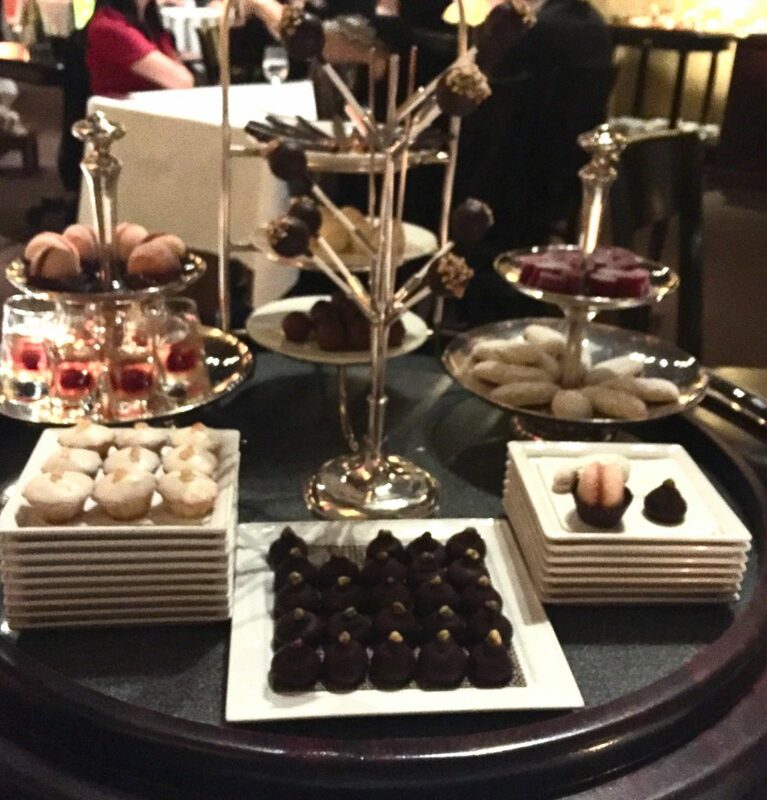 As expected, the petit four cart featured a diverse array of sweets, by now too much for Julie. I had just enough room for an almond cookie and chocolate bon-bon. I had them with a glass of Portolli double espresso from Milano. 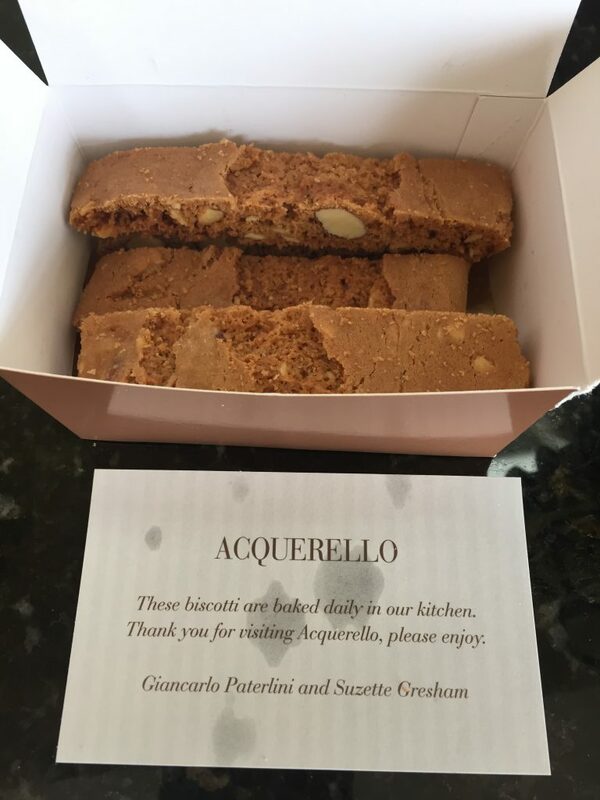 At the end, we were sent home with an elegant box of homemade almond biscotti, a signature Acquerello after-dinner present. 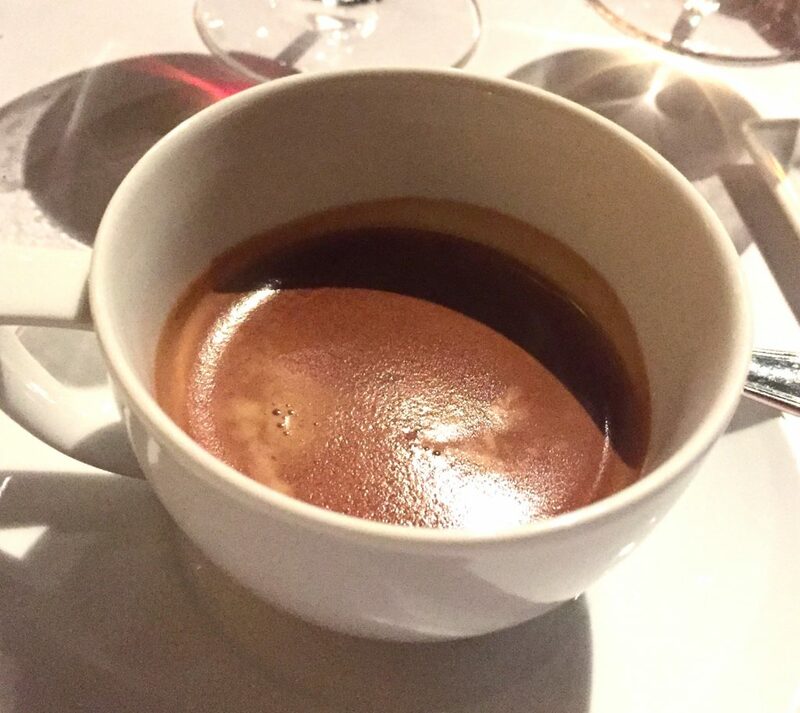 Acquerello is a treat to be experienced on special occasions. This one was a night-before-flight on the eve of a trip to Italy. Not all that special, but the dinner became an occasion onto itself, giving our trip an unforgettable start.